At Eurovision 2017, Hungary will be hoping that 35 year old performer Joci Pápai will be able to bring home the goods. The Eastern European country has come close to the top in recent years, reaching fifth place back in 2014. But the one thing that may stand in their way of Eurovision glory in 2017 is the fact their song will be in Hungarian. 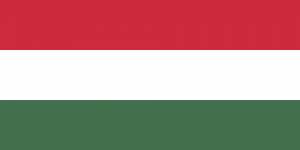 Big props to them for doing so too; Hungary is one of only four countries in this year’s competition performing in a language other than English. A reality TV talent contestant in the mid 2000s, Joci will be performing the track ‘Origo’, which in English means ‘Origin’. Though it’s unlikely to place within the top ten in the Grand Final on May 13, there’s plenty to like about the single. Joci provides a great vocal and a splash of rapping in the bridge. It’s got cool, interesting instrumentation and a great beat, which will help it to stand out amongst this year’s sea of ballads. A lot to like here. Huit points.